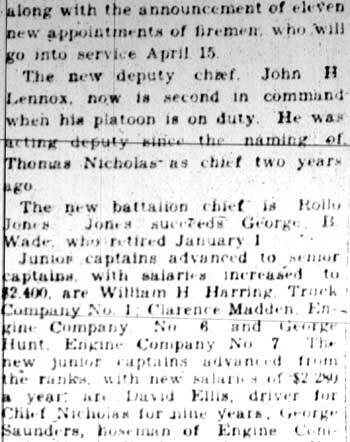 JOHN H. LENNOX was born in Ireland in 1879 to James and Katherine Lennox. 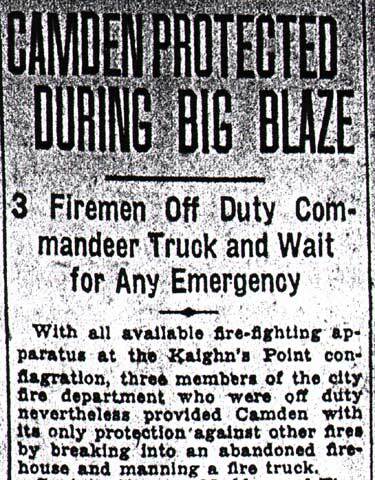 The family had emigrated to Canada by 1881, when son William was born, and came to Camden in 1885. 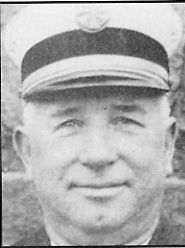 In November of that year another son, Edgar "Eggie" Lennox arrived. 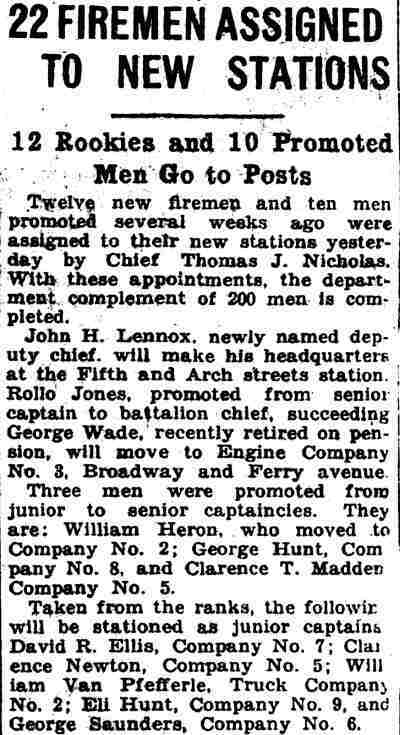 Mr. and Mrs. Lennox would have seven more sons, and a daughter, Margaret. 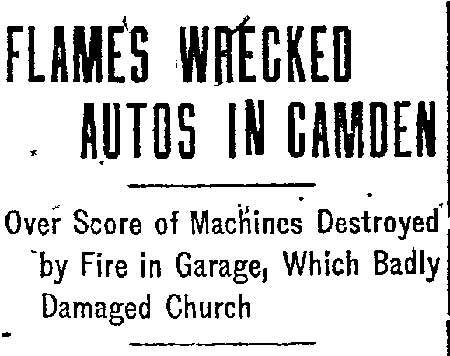 James Lennox worked as a laborer with the railroad. 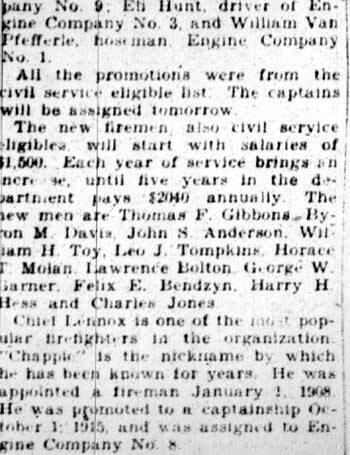 The Lennox family lived at 515 Taylor Avenue from 1885 through 1888, at 422 Evans Street in 1890, 515 Felton Street in 1894, and at 832 Line Street from 1895 through 1897. 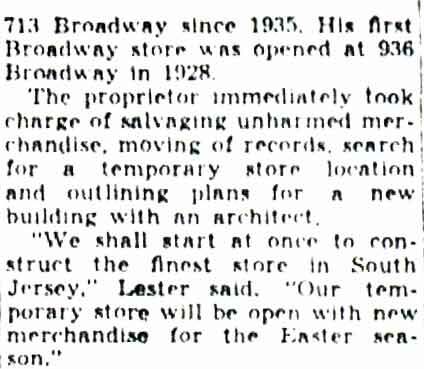 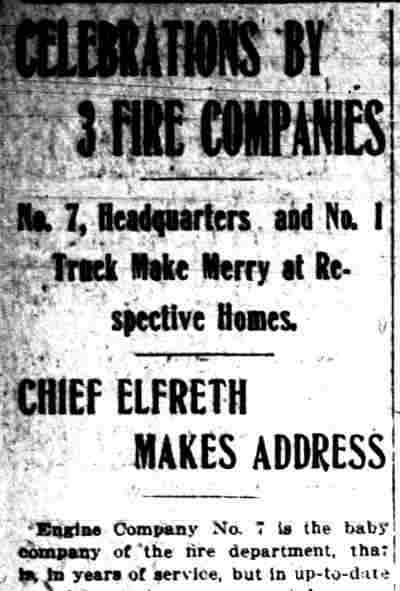 By 1898 they had relocated to 705 Blaine Street. 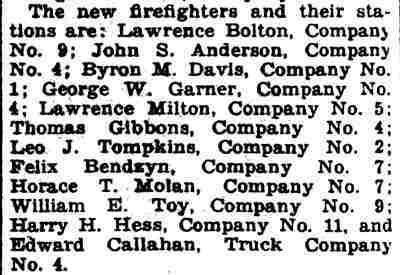 The 1900 Census shows the Lennox family at 705 Blaine Street. 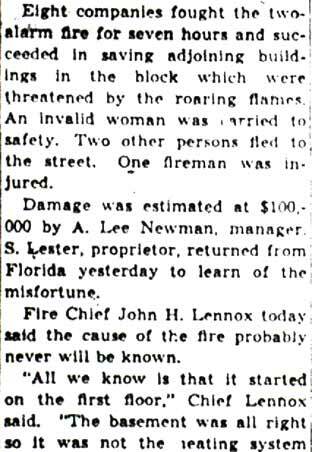 John H. Lennox was working as a helper in a blacksmith's shop at the time of the census. 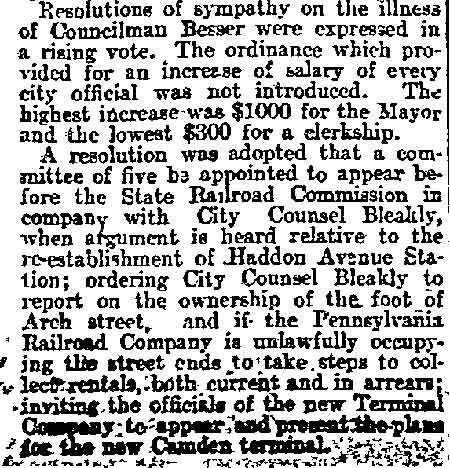 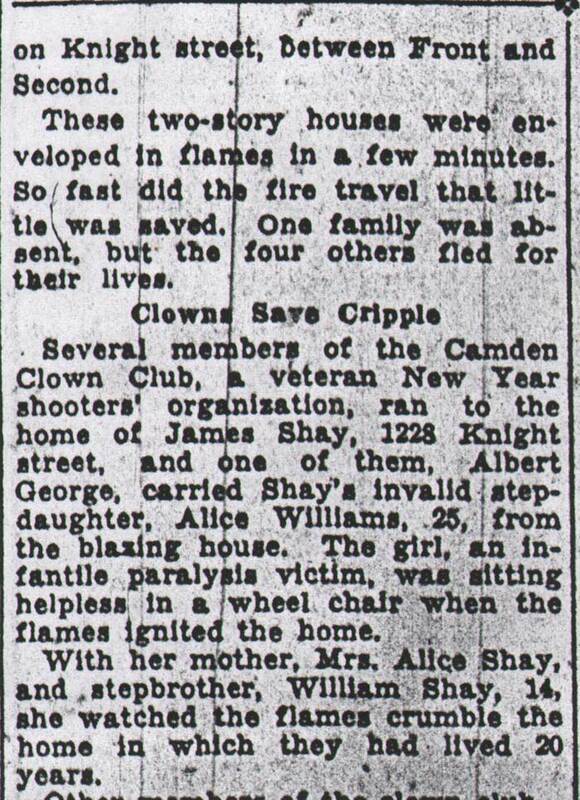 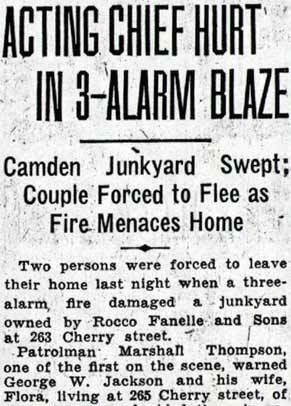 The family was still living at the Blaine Street address when the 1906 Camden City Directory was compiled. 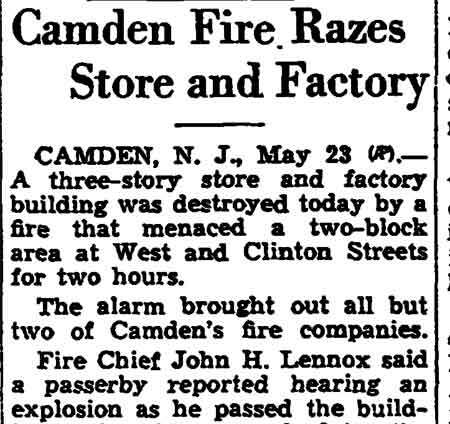 John H. Lennox was then working as a morocco finisher at one of Camden's leather factories. 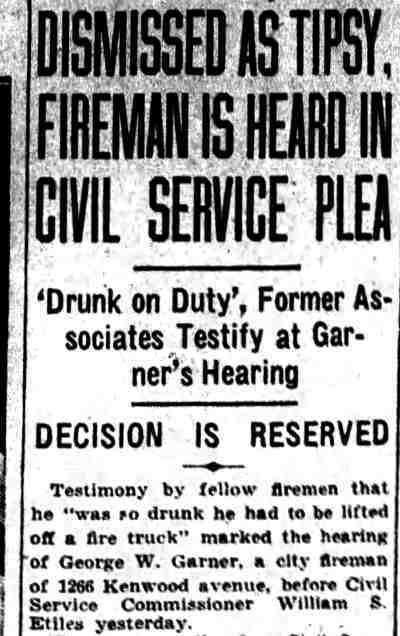 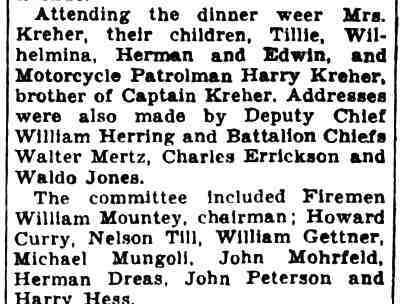 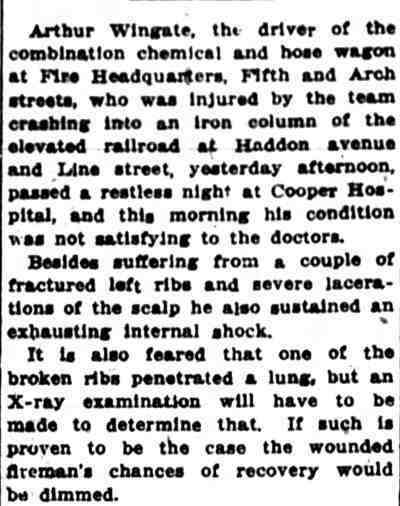 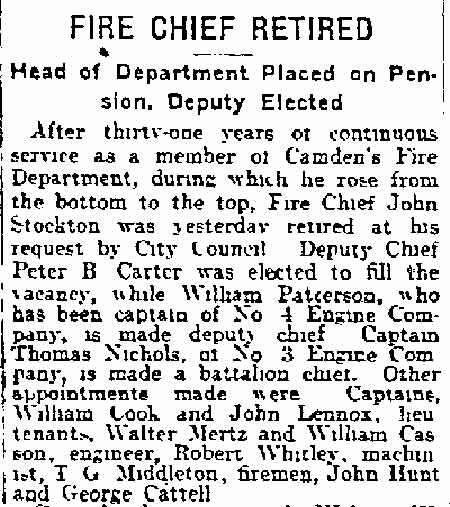 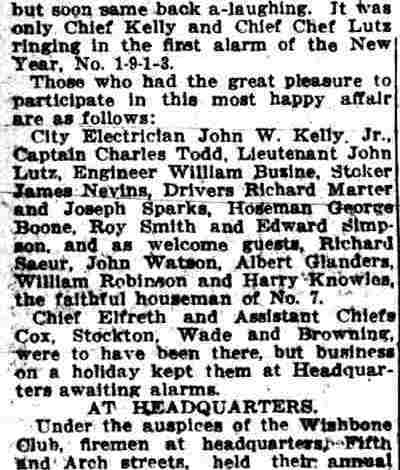 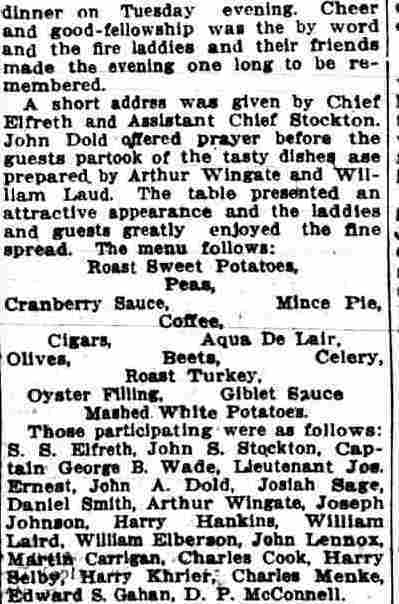 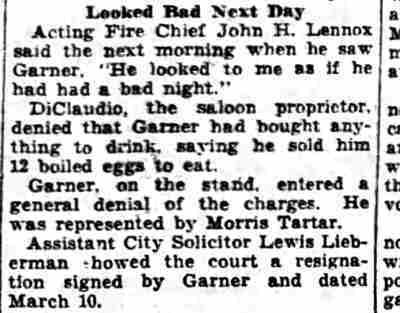 John Lennox was appointed to the Camden Fire Department on November 27, 1907 and reported for duty on January 1, 1908. 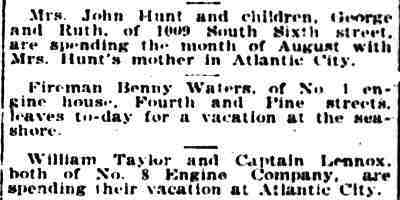 At the time of the 1910 Census he was still living with his parents and siblings. 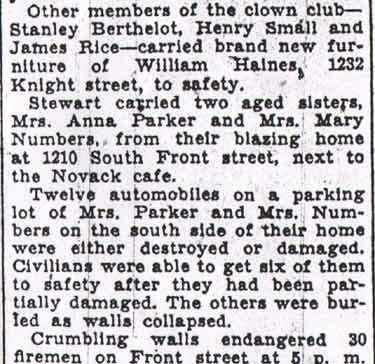 The family was then residing at 511 Newton Avenue. 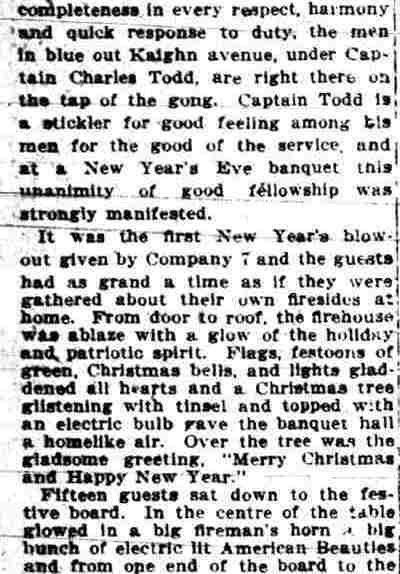 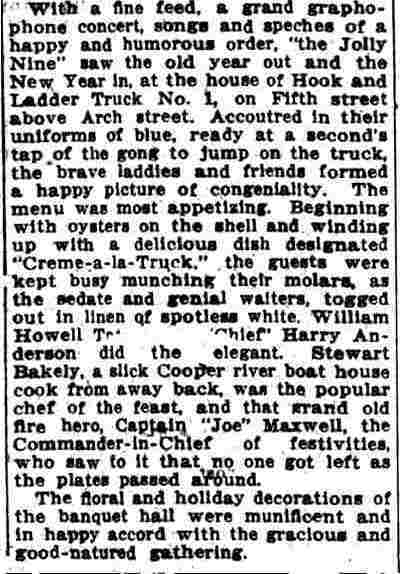 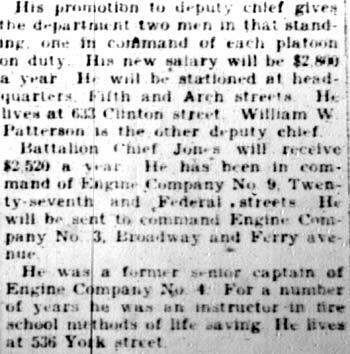 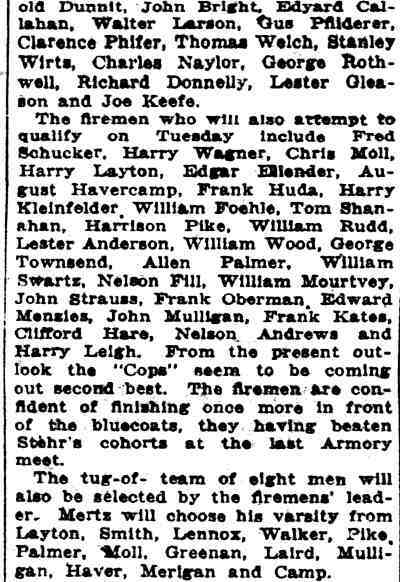 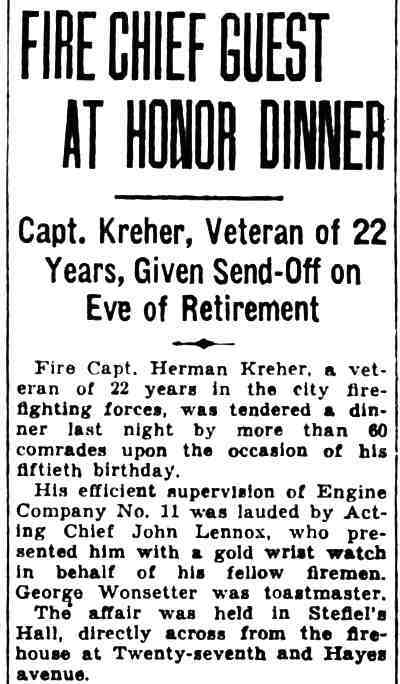 John Lennox was promoted to Captain in 1915, and assigned to Engine Company 8. 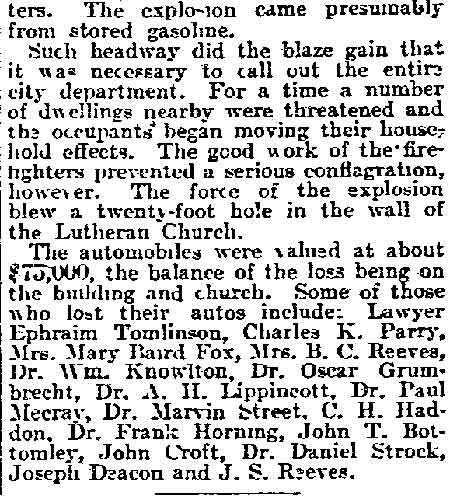 In 1919 John Lennox married a widow, Caroline Osborn Lea. 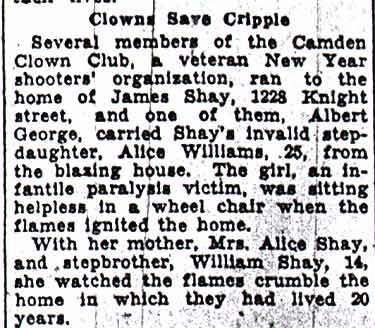 By 1919 they owned a home at 633 Clinton Street. 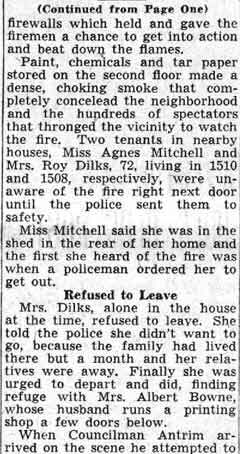 Also at home was a step-daughter, Miriam Lea, then 17. 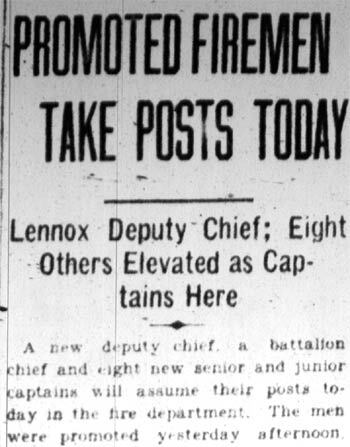 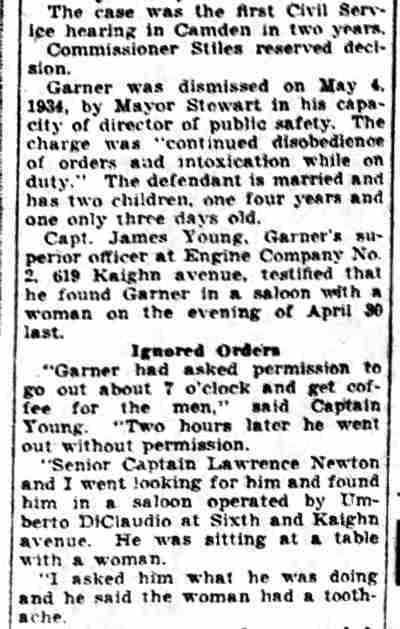 Captain Lennox was promoted to Deputy Chief on April 4, 1928, with a salary of $2,800 per year. 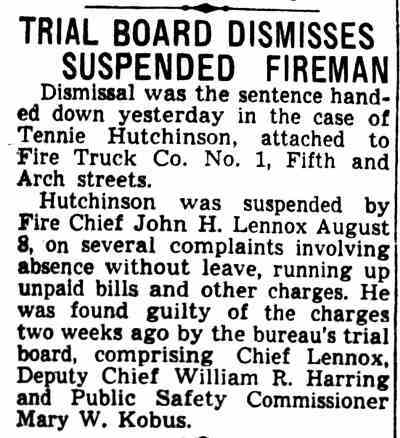 He was stationed at Fire Headquarters at Fifth and Arch Streets. 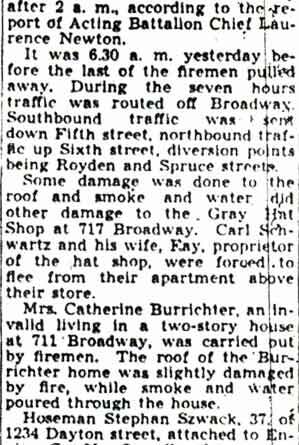 Mr. and Mrs. Lennox still resided on Clinton Street in April of 1930. 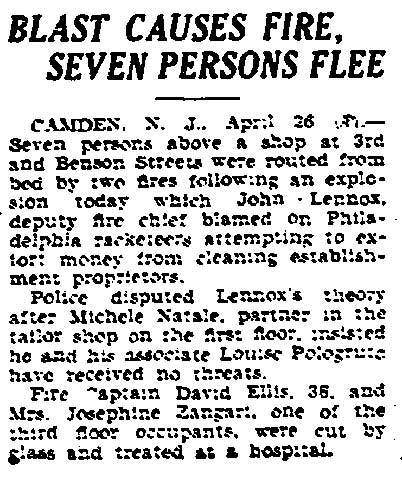 Mother-in-law Louisa Osborne was then living with them. 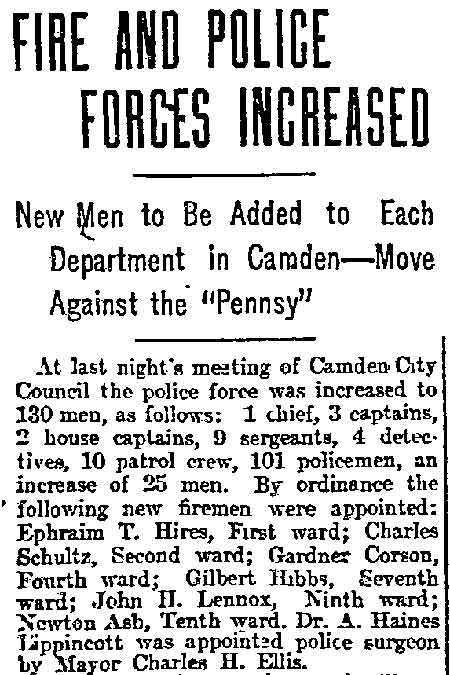 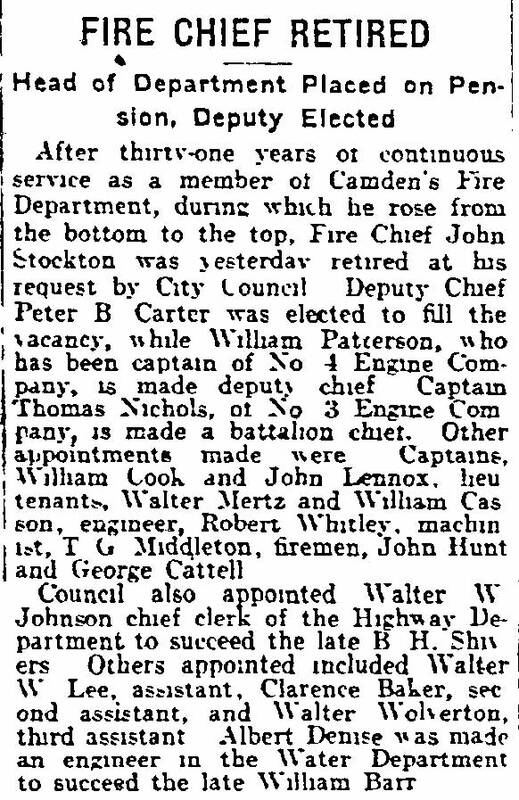 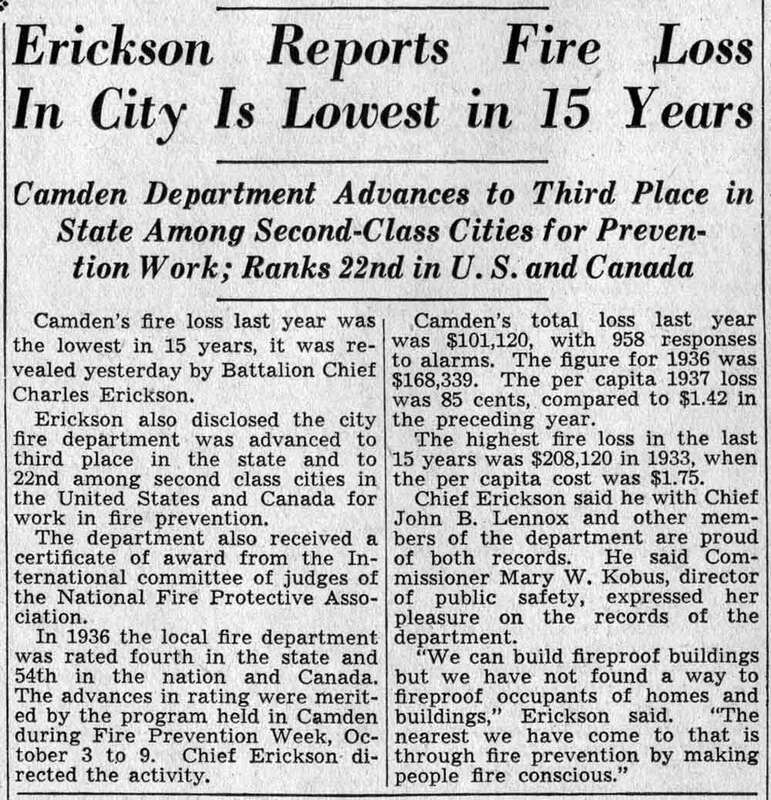 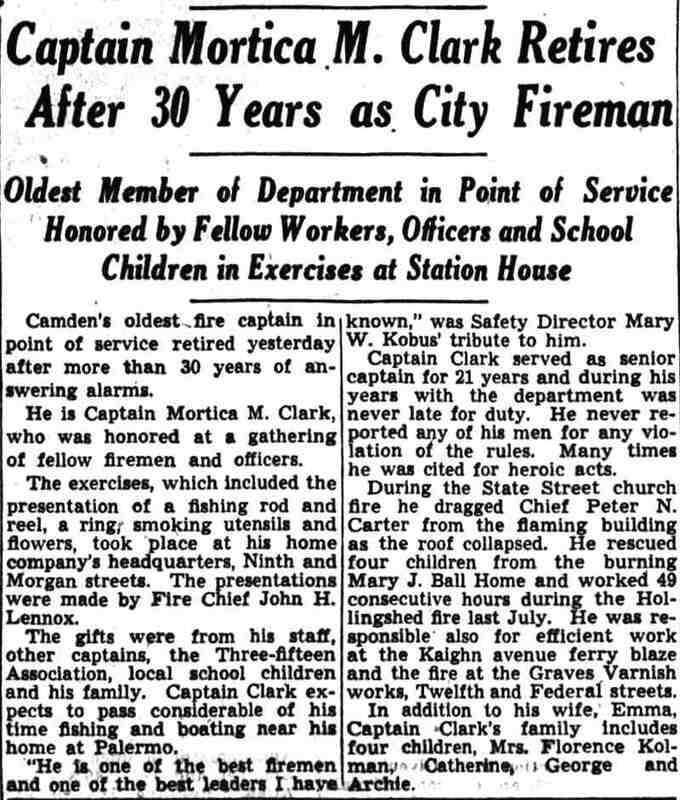 John H. Lennox was named as acting chief of the Camden Fire Department on December 1 of 1932 by then-Mayor Roy R. Stewart, succeeding Thomas J. Nicholas. 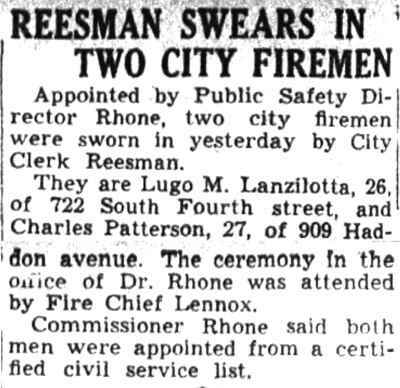 John Lennox was made Chief on October 1, 1934. 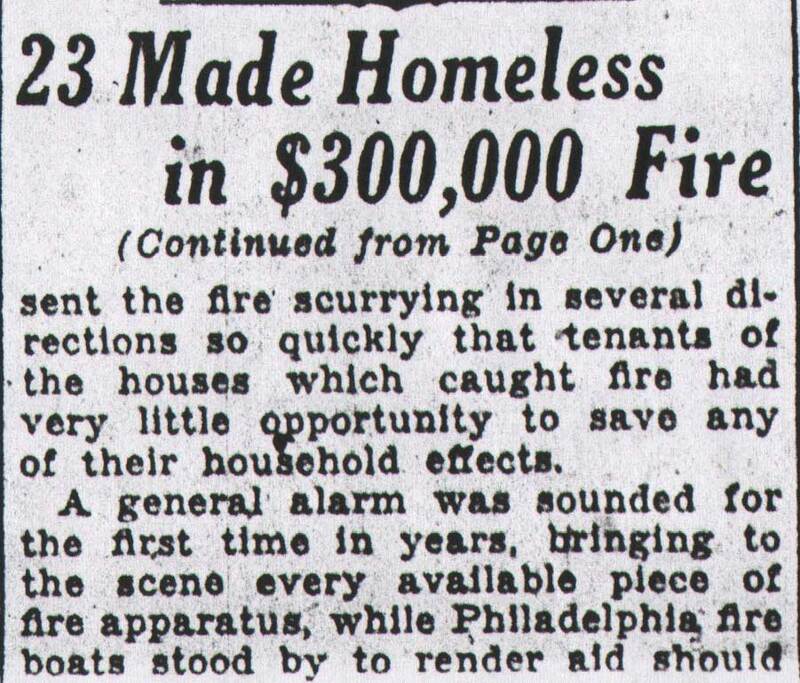 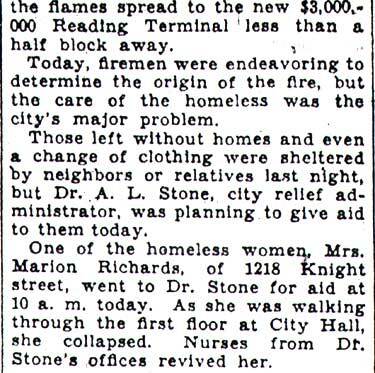 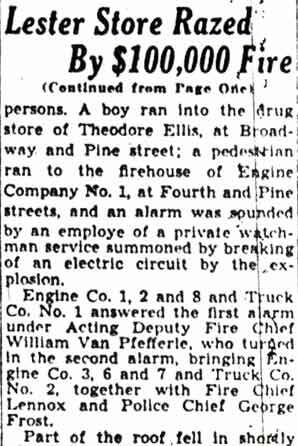 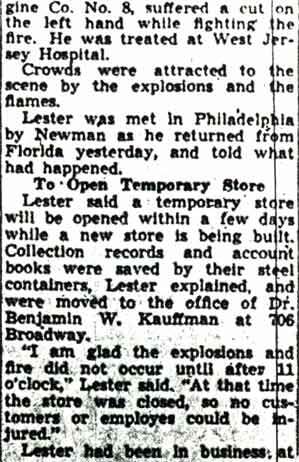 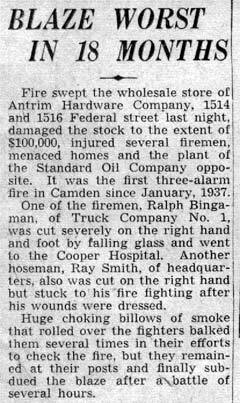 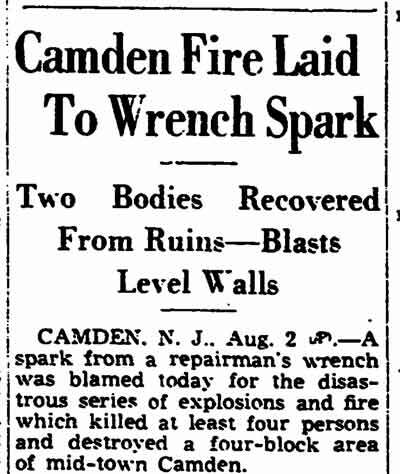 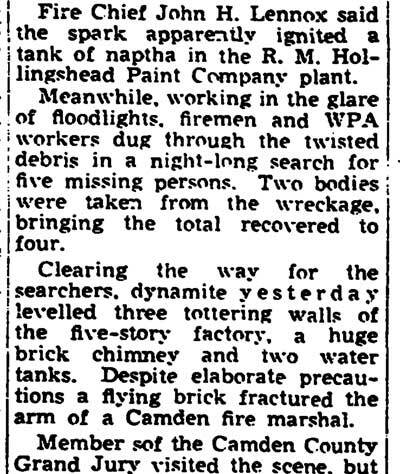 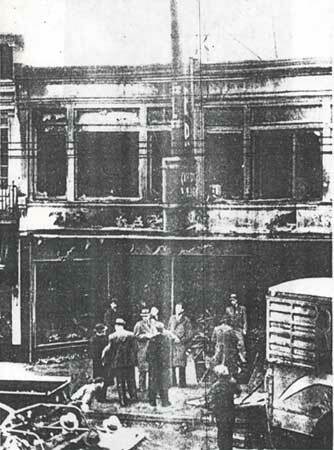 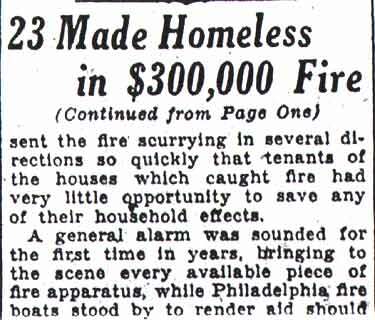 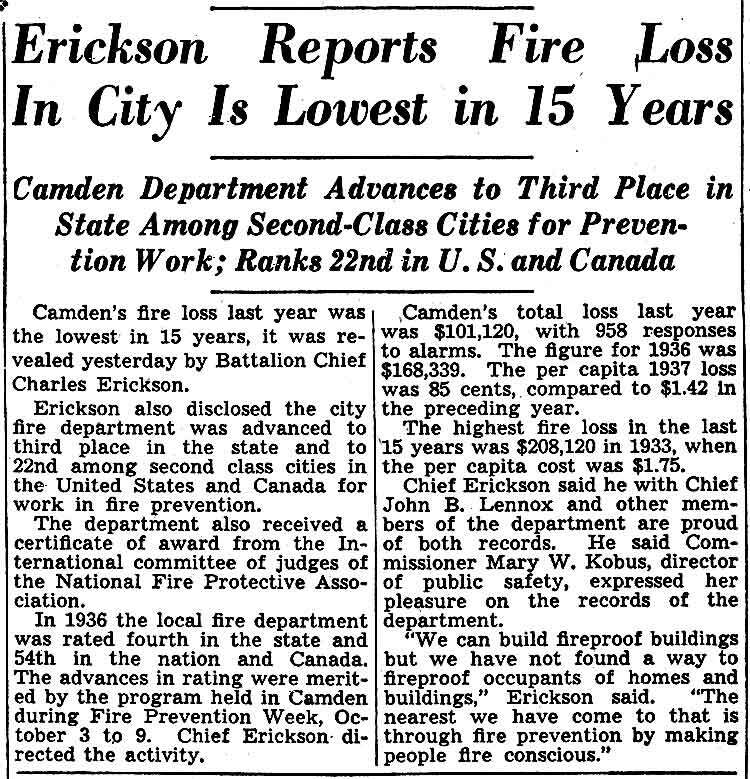 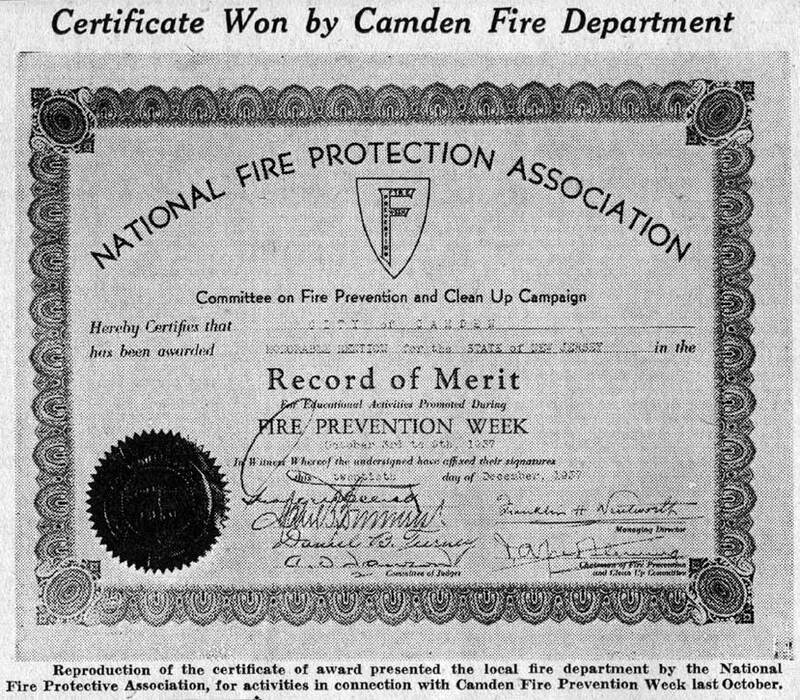 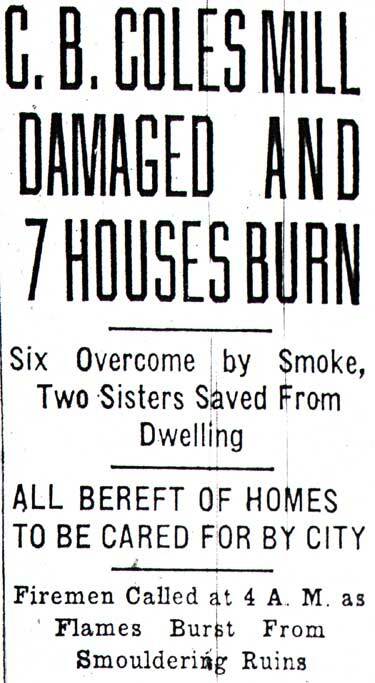 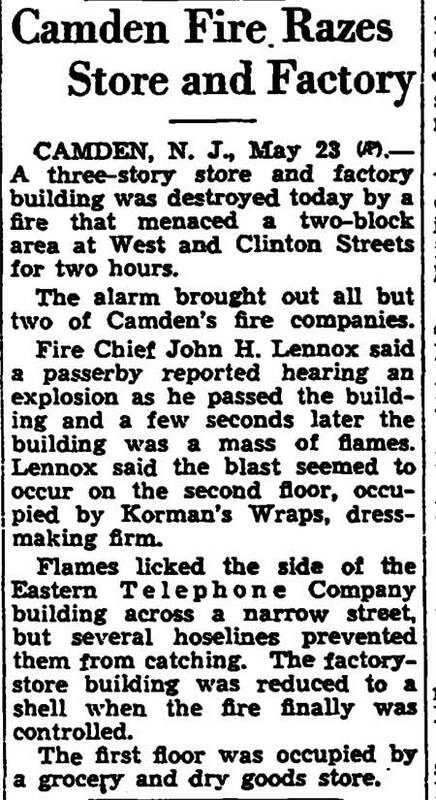 Shortly after 7 A.M. on May 23, 1941, a Box was transmitted for a fire at West and Clinton Streets, South Camden. 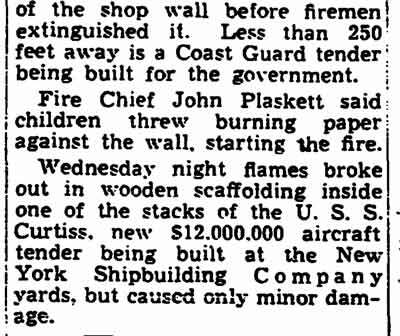 Arriving companies found a three-story commercial building with fire roaring one hundred feet into the sky. 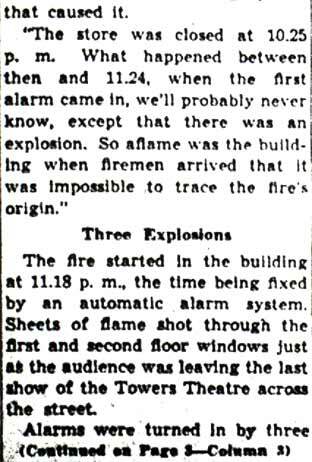 A second alarm was transmitted on arrival, followed by third and fourth alarms ordered by Chief John Lennox. 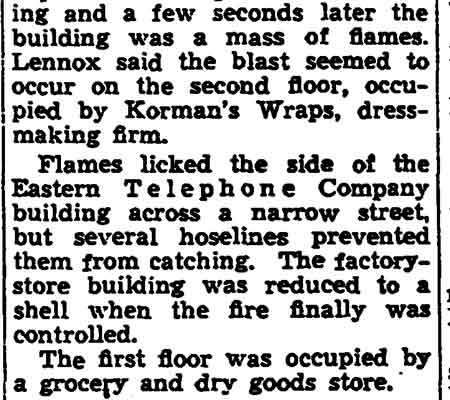 The building contained a food market on the ground floor and a clothing factory above. 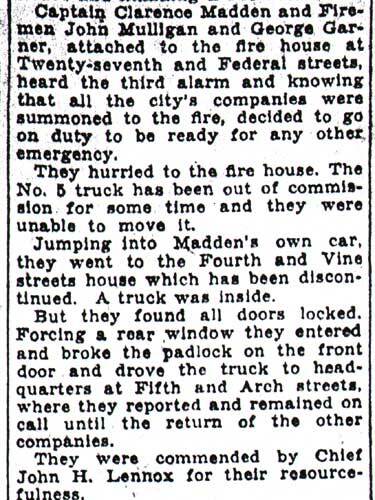 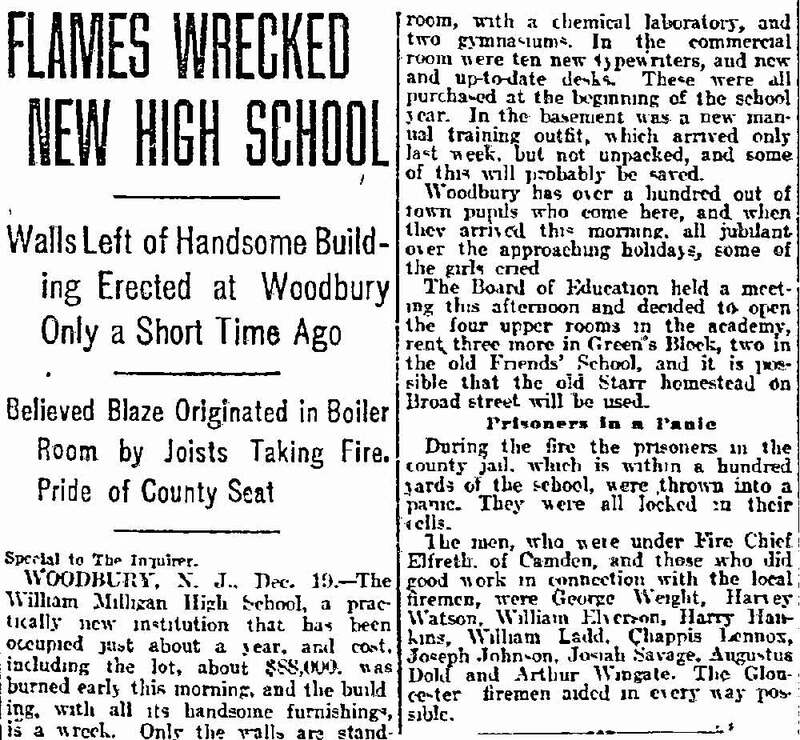 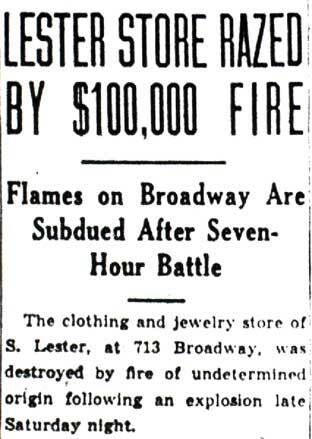 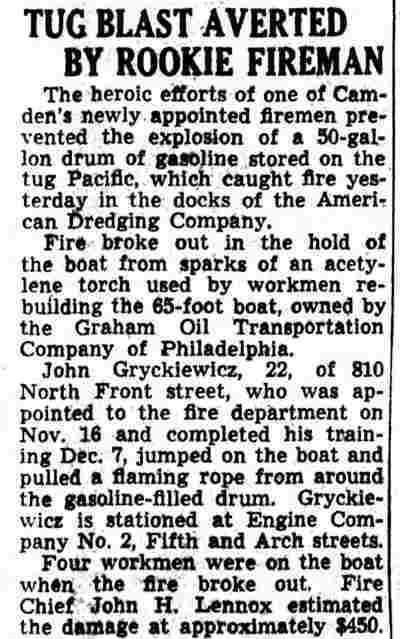 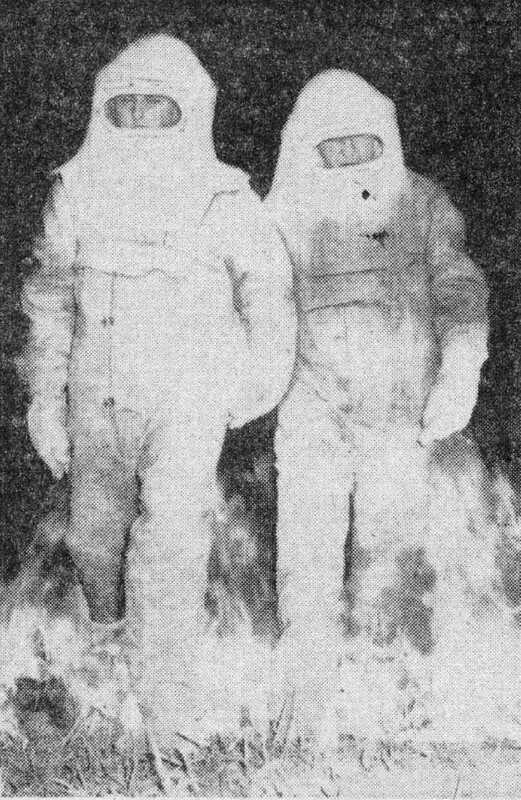 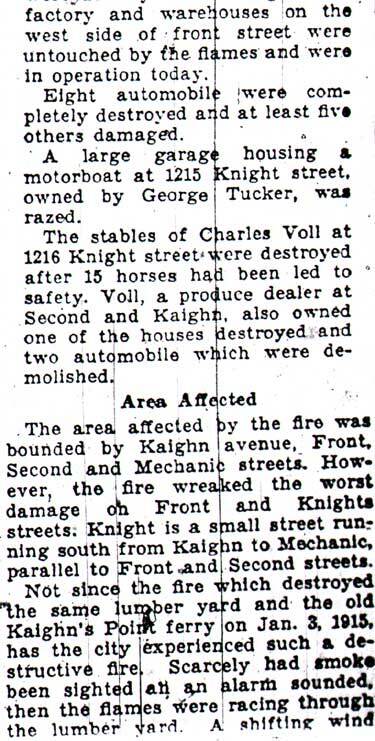 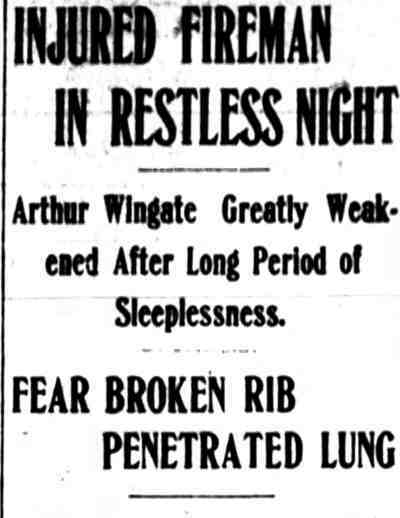 At the height of the blaze, Firemen Clarence McMullen and James Creato narrowly escaped with their lives after a burst of flame nearly enveloped them as they forced an interior door to a shaft. 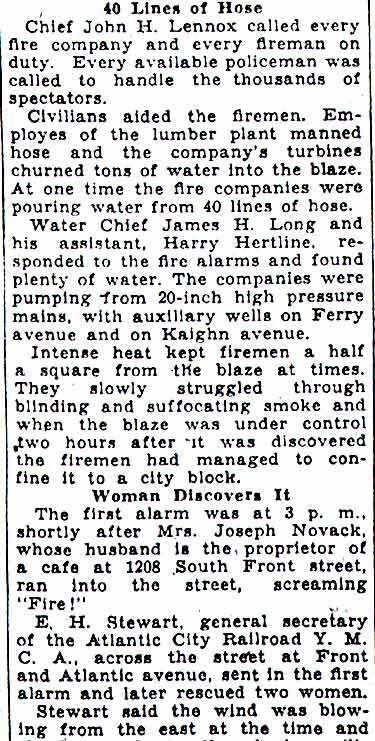 Both members fought their way out under the cover of hose streams directed by their comrades. 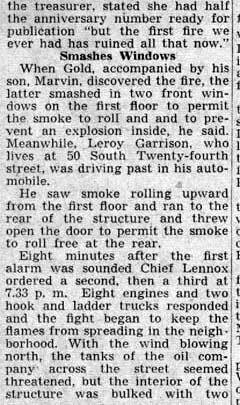 Chief of Department Lennox and four firemen while at the far end of the blazing building on West Street, heard the shrill cries for help coming from a nearby dwelling. 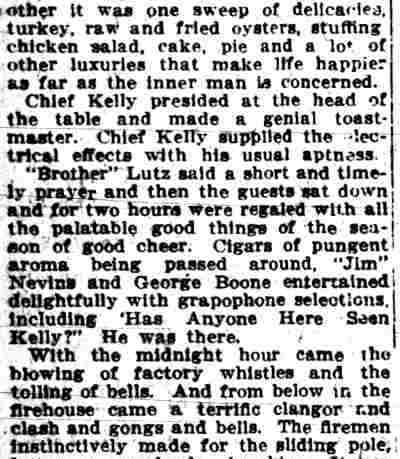 Racing into the home of Mrs. Elizabeth O'Hanlon at 423 Clinton Street, they found an excited albeit unscathed parrot, in a kitchen birdcage still crying for help. 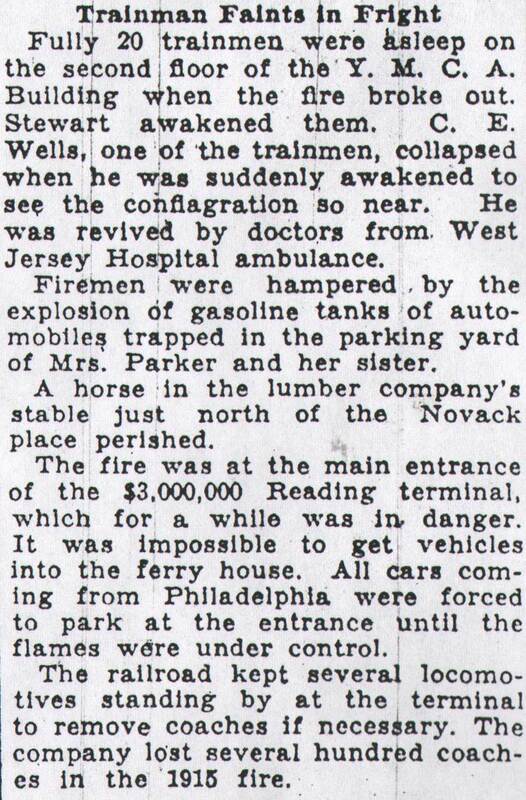 The bird was carried to safety by the firemen. 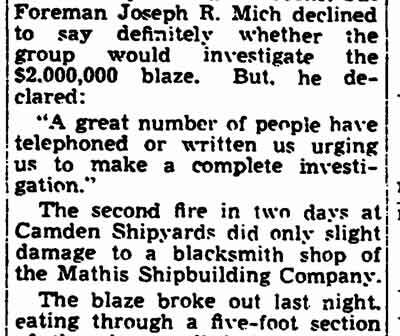 The blaze was brought under control at 10:30 A.M. but not before heavily damaging the block long building. 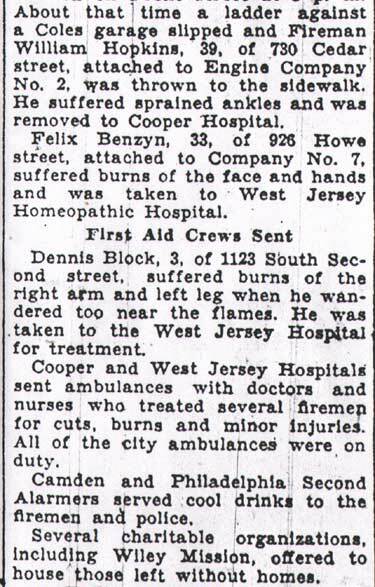 After a long illness, John H. Lennox passed away in February of 1947. 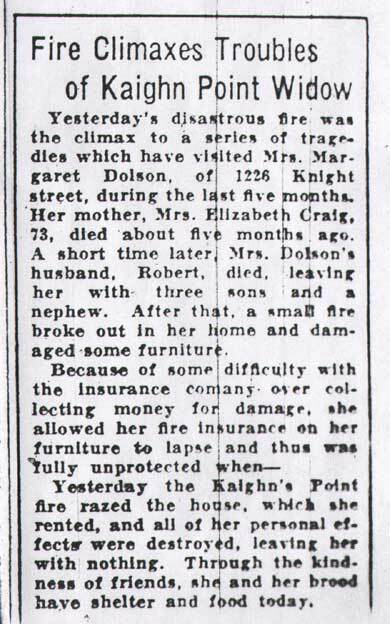 His widow Caroline was still residing at 633 Clinton Street in that year. 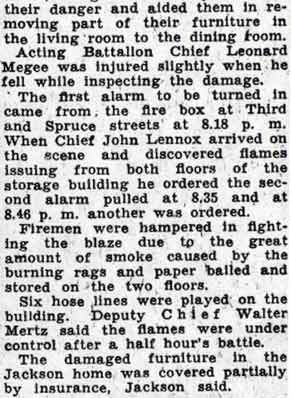 Chief Lennox was succeed by Chief Walter Mertz. 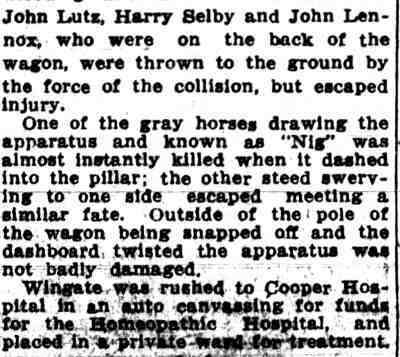 John H. Lennox was preceded in death by his brother Edgar. 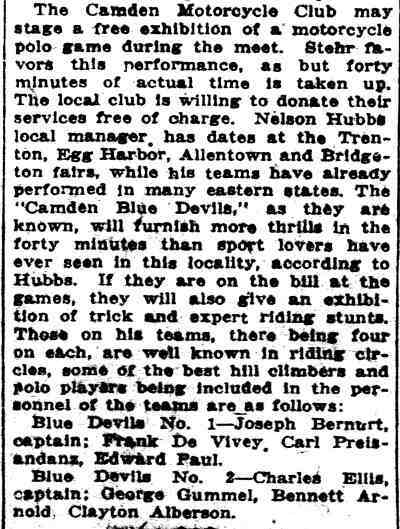 Edgar Lennox, known as Ed and also by his nickname, "Eggie", was one of the best sandlot baseball players in Camden at the turn of the century. 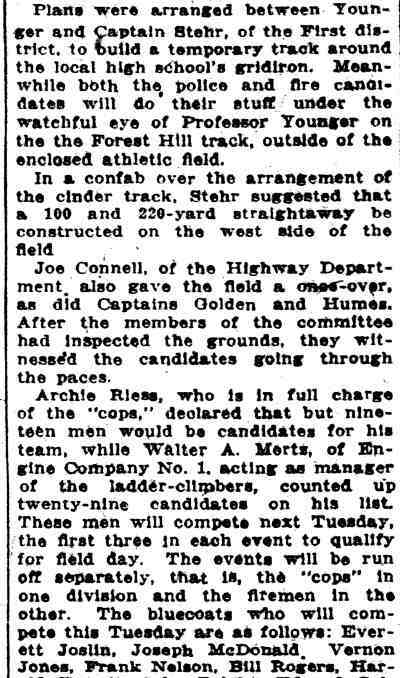 He rose to the major leagues, playing in parts of five seasons, and stayed in baseball as a player, umpire, and scout for most of the rest of his life, before passing in October of 1939. 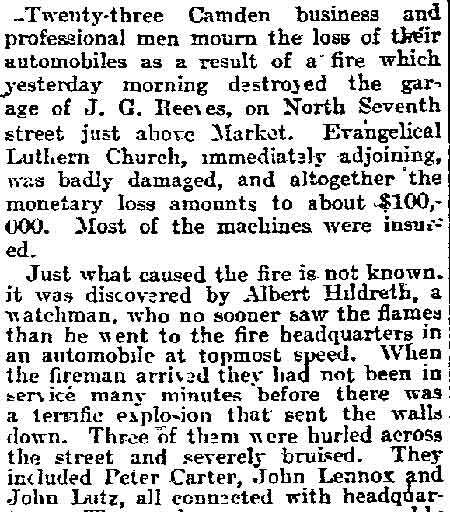 Three of John Lennox's brothers were also know locally as good ballplayers. Brothers Robert and Samuel both played minor league ball. 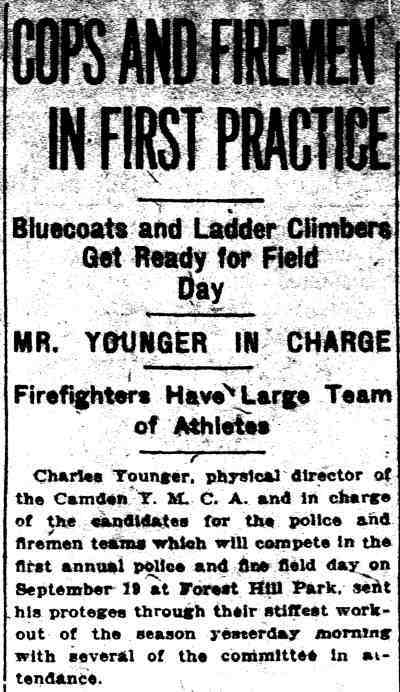 Samuel Lennox also played professional basketball as a member of the Eastern Basketball League champion 1919-1920 Camden Crusaders. 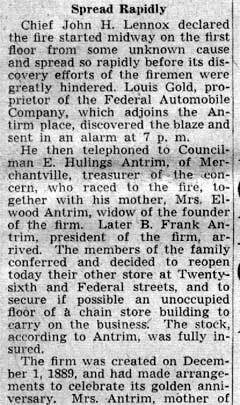 Mrs. Caroline Lennox was active in Republican politics, serving as president of the Ninth Ward Women's Republican Club in the late 1920s. 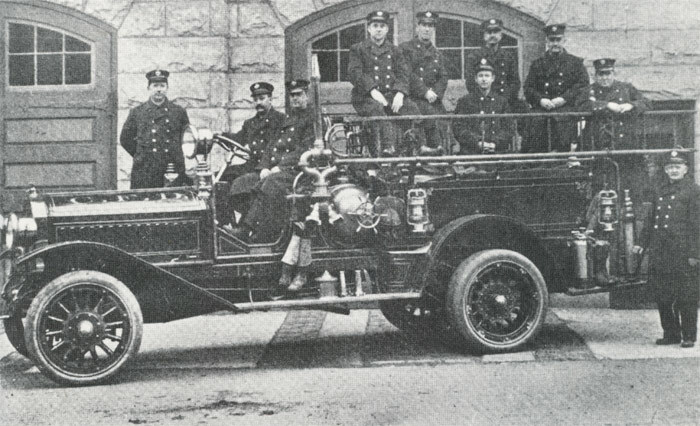 This 1912 Robinson Combination Chemical and Hose Wagon was assigned to Engine Company 2. 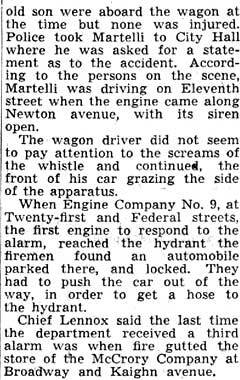 It was one of two purchased as the first motorized apparatus in the Department. 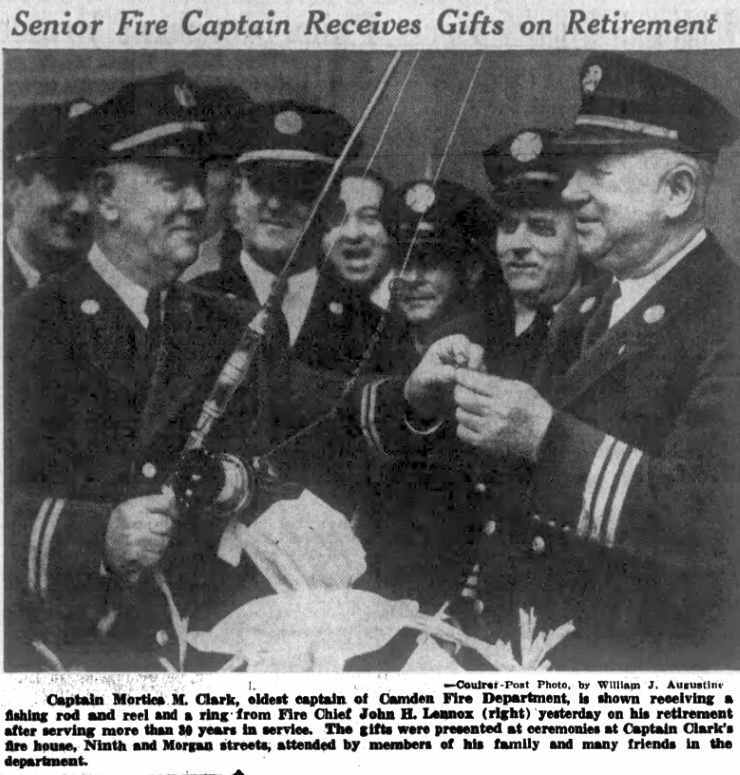 Pictured in this 1913 photograph are (l to r): Fireman John Lennox, Wagon Chauffer Harry Hankins, Firemen William Elberson, Joseph Ernst, Martin Carrigan, and Captain George Wade. 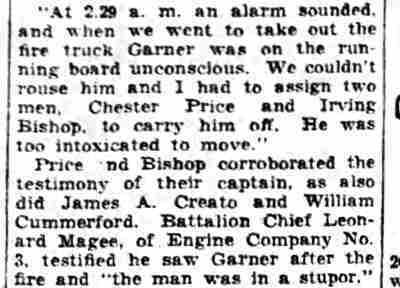 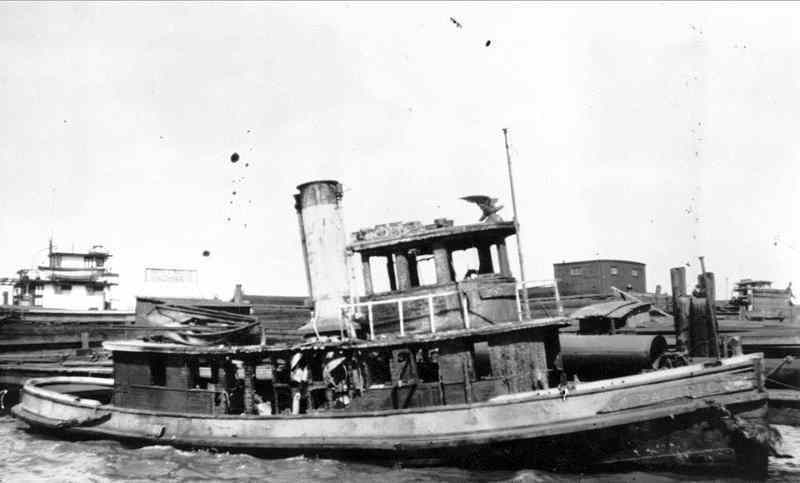 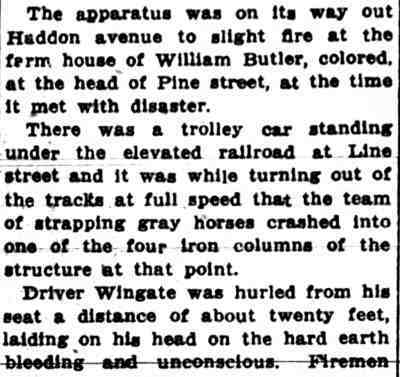 Accompanying them are members of the engine crew: Stoker Arthur Wingate, Driver Joseph Johnson and Engineer John Augustus "Gus" Dold. 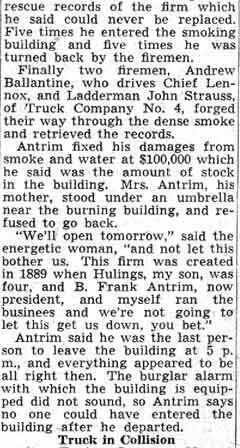 $100,00 FIRE SWEEPS STORE OF ANTRIM CO.